Burnley 0-4 Chelsea: Anything you can do. Football hasn’t been a place for levity this weekend. Too many people at Leicester and at Brighton have died in the simple act of going to a football game. Glenn Hoddle almost died on the floor of the BT Sport studio. It doesn’t seem right to produce the usual litany of mockery here this week. A short write up of our game follows, and normal service will be resumed again on Wednesday when we welcome Frank back to the bridge. Rudi, Luiz, Dave and George Michael all returned to the back line, and Kante and Jorginho came back in the starting line up. Barkley got a start over Kovacic, completely warranted at the moment and Pedro Pony comes in for for Eden, whose back is still giving him jip. Loftus Cheek was rewarded with a place on the bench after his Europa League heroics in midweek. 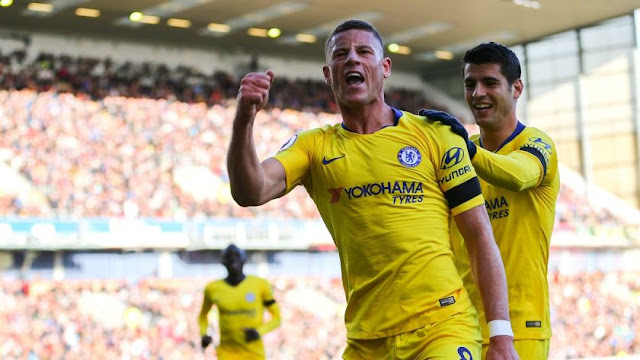 Burnley have begun to motor after an appalling start to the season, which is typical as far as we are concerned, but Sarri was bidding to become the first Premier League manager to go through his first ten games unbeaten. We started well enough. There was a chance for Morata and Barkley to put us ahead early on, but otherwise pretty even. Brady put it wide on 16 minutes too, though Kepa was fouled with an arm in the face. Luiz was determinedly evening up the score on that front, laying into Vokes with a little too much vigour. Burnley got extremely lucky when Little Willy hit the post on 20 minutes and nobody was coming in on the follow up, but they weren’t so lucky a minute later when Barkley put a sublime ball through to Morata, who made a perfectly timed run and slipped it into the net. He’s starting to score regularly now, although of course every time he falls over or makes a pig’s ear of a chance it still provokes a torrent of criticism. Barkley has already played double what he did for the entirety of last season. We lost Pedro Pony on the half hour, he is still wearing a harness over his bad shoulder and something not right at all. Definitely un fortunate Pony Pedro today. Good news at least for Loftus Cheek, who was going to get more action than anyone anticipated with an hour left to play. Despite this upheaval we continued to establish complete dominance. Morata made a great run, after Alonso was sent on his way by Barkley, but this time the Spaniard’s finish was wide after he wasted time taking it onto his right foot. And yet, typically of us there was still only one goal in it. Morata was in again on 41, but the ball would not have been an easy one for him to have convert. He was, however, making a mockery out of the Burnley defence with his runs. He went down in the box, but it wasn’t a dive in particular. It was a good tackle, Alvaro didn’t overreact particularly, but something was said and handbags were brandished. The home side were lucky when Pawson decided to just book everyone involved. A justifiable yellow for Willian, however, for an easy collapse in the box followed shortly afterwards. Morata almost scored again on 55, then along came Barkley. Wasn’t passing that. Was he f*ck. Outstanding solo effort from range that left suckered Tarkowski and Joe Hart and doubled our lead. You could have bought Pogba four times for what we paid for him. Over to you Ruben. It was game over 62 minutes thanks to Willian. Hart done again from long range, thanks in part to a slight deflection off his own defender. The Beard came on for Morata, who was already booked and losing his rag with defensive roughhousing and he hit one wide of the post on 77. He also rattled the bar, and was unlucky not to get on the scoresheet today. In the meantime Cesc made his season debut in the league in the act of giving Sarri stalwart/lovechild Jorginho a rest. RLC was desperately trying to make his mark too. He kicked it into the side-netting before managing to pounce on a loose ball in the box to make it four. Hart has conceded 9 in two games and looked as depressed as you’d expect.